The Garmin StreetPilot c340 provides in-car navigation that is simple for anyone to use directly out of the box. After selecting a destination from the user-friendly touch screen interface, Garmin's text-to-speech feature tells users the name of the street, when to turn, and in what direction. If you miss your turn, the Garmin StreetPilot c340 automatically calculates a new route to the destination. Garmin StreetPilot c340 has been discontinued. Accessories, spares and parts are still available for your StreetPilot C340, as are road maps. Notification of traffic delays is a Garmin StreetPilot c340 option that lets drivers see congested areas via a color-coded map. This feature lets users avoid traffic by simply pushing a button that will calculate a new route. This traffic awareness is made possible via the new Garmin GTM 11 FM TMC receiver that connects to selected Garmin street navigation products. The GTM 11 receives digital data from specific FM broadcast stations in select major metro areas throughout the United States and Europe. The Garmin StreetPilot c340 comes preprogrammed with highly detailed City Navigator® NT street data of the entire United States, Canada, and Puerto Rico. The database features nearly six million points of interest-including hotels, restaurants, gas stations, ATMs, and attractions. As an added benefit, you can now import customized points of interest with the help of Garmin's free POI Loader software. The possibilities are endless - upload safety cameras or school zones, and you will receive a warning if you are traveling too fast. In addition, an optional proximity-alert feature notifies you of upcoming custom POIs. The Garmin StreetPilot c340 joins Garmin's growing line of automotive GPS navigators. It has a bright, 3.5-inch diagonal, TFT display with touchscreen; dual integrated speakers for high-quality voice prompts; and an internal lithium-ion battery for out-of-car route planning. ‣Text-to-Speech - unit prompts you to "Turn right on High Street" instead of "Turn right in 500 feet"
The Garmin StreetPilot c340 boasts distinctive and sleek styling - the only buttons are a rotary volume knob and an on/off switch. The device is secured by a suction-mount cradle that fastens to the windshield for easy portability between vehicles. Users can customize their unit's appearance with an array of colored faceplates (sold separately). 12-volt adapter included. Looking for accessories and spares for the Garmin StreetPilot c340 view them all here. 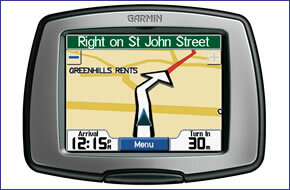 All parts are genuine Garmin product and specifically designed for use with the StreetPilot c340 sat nav.